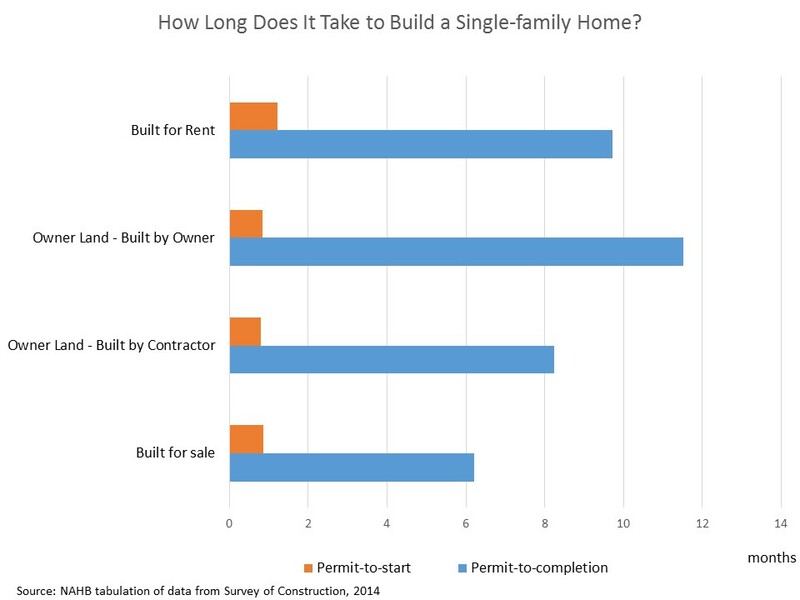 Top Posts of 2015: How Long Does It Take to Build a Single-Family Home? With the end of 2015 approaching, NAHB’s Eye on Housing is reviewing the posts that attracted the most readers over the last year. In August, we examined construction time trends for single-family homes. A separate post also examined multifamily trends. 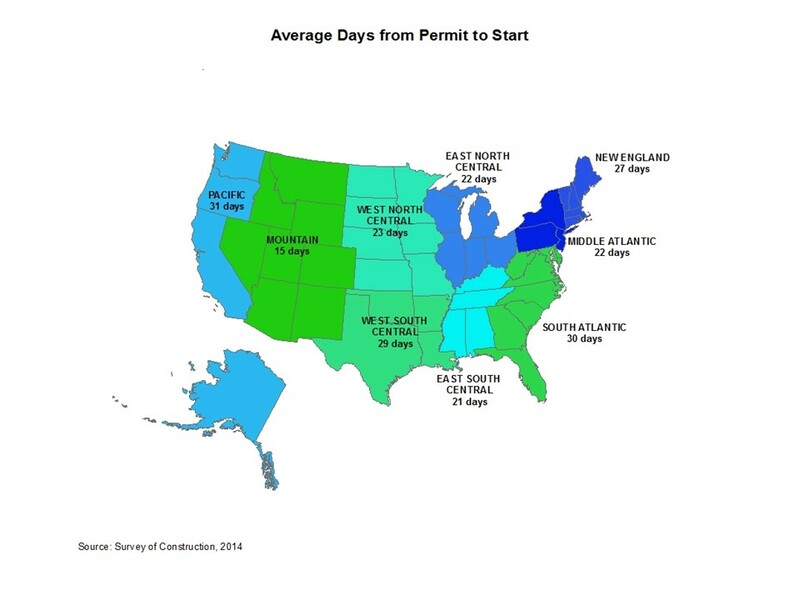 The 2014 Survey of Construction (SOC) from the Census Bureau shows that the average completion time of a single-family house is around 7 months, which usually includes around 25 days from authorization to start and another 6 months to finish the construction. The timeline from authorization to completion, however, is not consistent across the nation, depending on the housing category, the geographic location, and metropolitan status. Among all the single-family houses completed in 2014, houses built for sale took the shortest time, 6 months to completion after obtaining building permits, while houses built by owners required the longest time, 11.5 months. Single-family homes built by hired contractors had around 8 months from permit to completion, and homes built for rent normally needed between 9 and 10 months. Compared to a prior 2012 analysis, the average permit-to-completion timespan of single-family houses built for sale and for rent was one month longer in 2014. A large proportion of single-family homes built for sale and on owners’ land built by either owners or contractors began construction within the same month after obtaining building authorizations. 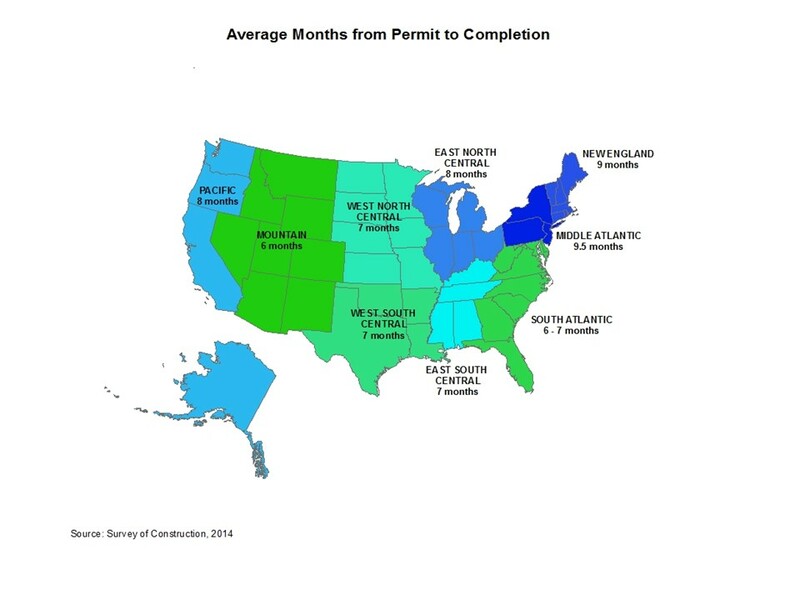 However, homes built for rent typically had a one-month lag between permits and construction start in 2014. The average time from authorization to completion also varies across the nation. The Middle Atlantic division had the longest time of 9.5 months, followed by New England of 9 months, Pacific and East North Central of 8 months in 2014. These four divisions all had above average time from permit to completion. The shortest period, 6 months, happened in the Mountain division, which also had the shortest waiting period from permit to construction start. The metropolitan status indicates how long it takes to build a single-family home. 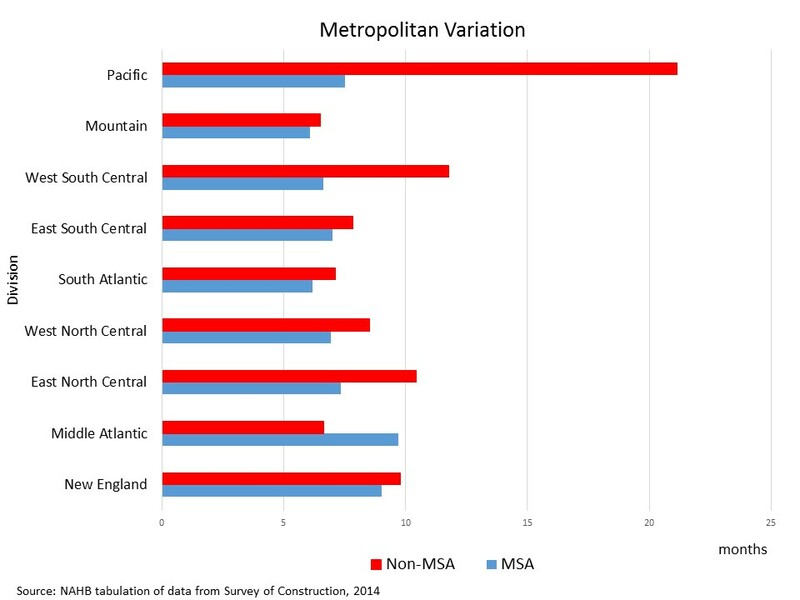 Houses in metropolitan areas, on average, took nearly 7 months to completion, which was 2 months shorter than those in non-metropolitan areas. This pattern was quite consistent across the nation, except for the Middle Atlantic division where the average month to completion in metropolitan areas was longer than in non-metropolitan areas in 2014. The SOC also collects sale information for houses built for sale, including the sale date when buyers sign the sale contracts or make a deposit. In 2014, the share of single-family sold while under construction was almost 70 percent, with 30 percent even sold before construction start and 12 percent sold during the same month of completion. The percent of single-family houses completed in 2014 stayed unsold at the first quarter of 2015 fell to 5 percent from 6 percent in 2012, indicating an improving sale market for single family homes. IT’s not that big when you invest hard. Let go though the time and investment will be worthy. Facts you show may depends on the area as well as the scale of builders.